Maersk Line has lifted its congestion surcharge of $150 per 20-foot container imposed earlier on shipments to and from the Port of Nhava Sheva (Jawaharlal Nehru),India. The Danish carrier in a notice to customers said the congestion and delays that gripped the country’s largest container port over the past few weeks have subsided in recent days, allowing restoration of normal operations at the terminals. 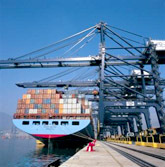 Nhava Sheva Port, with a state-owned terminal and two private facilities, handles almost 60 percent of India’s total containerized traffic. Throughput in fiscal year 2012-13, which ended March 31, 2013, totaled 4.26 million 20-foot-equivalent units, down from 4.32 million TEUs in the previous year.